Reed Art & Imaging has a long-standing commitment to helping you maximize your artistic output by providing the absolute best reproductions and presentations that we can. An extension of that commitment is our recent acquisition of North America’s very first Diasec Producer’s License. If you’ve never heard of Diasec, you are in the majority. Until now, this premier mounting process has never been done in North America. 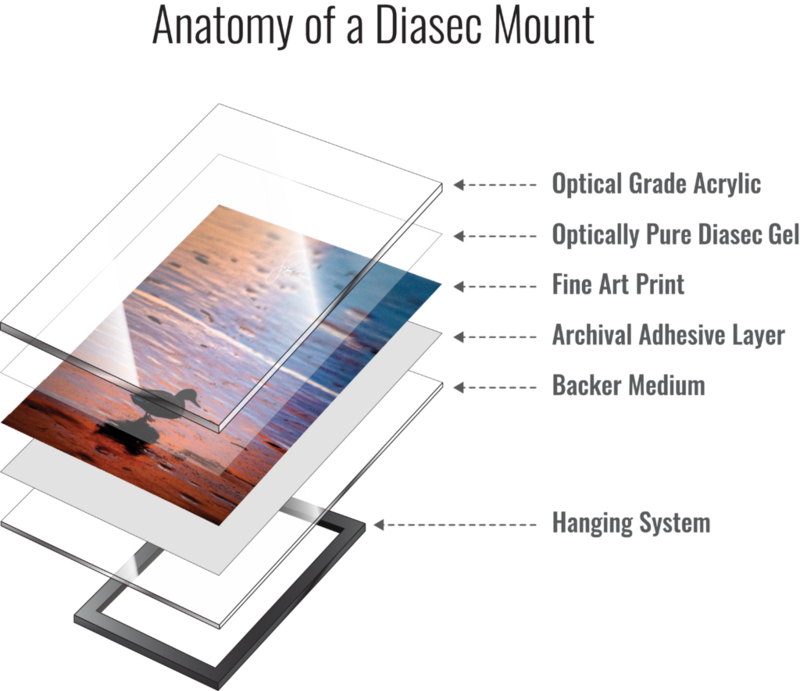 Some of you might be aware that leading art museums around the globe prefer Diasec over all other acrylic print mounting systems and is the preferred process of successful fine artists in Europe. You might also know that North American Museums and Galleries who offer authentic Diasec prints have been importing them for years at great expense. Diasec is a presentation AND a preservation process. A very specific silicon gel, in combination with Diasec’s proprietary catalyst, results in a permanent bond that is superior to the pressure-sensitive adhesive technology that you might be familiar with. This bond is so effective, that it preserves your artwork by sealing out damaging elements — even in extreme environments. Face-mounting was patented approximately 50 years ago in Switzerland by Heinz Sovilla-Brulhart, who held the patents on several forms of print-to-acrylic bonding methods. He started out using varnishes and film-based adhesives before improving the system by developing a catalyst-activated silicon gel. When his patents expired, the simpler and less expensive processes that Sovilla-Brulhart had already discarded were adopted by the rest of the industry worldwide, leaving only a few producers of the silicone/catalyst process. To this day, it remains a closely guarded secret available only to licensed companies. A few copycat processes have come along, but without the special catalyst, they lack the half-century track record of consistency and excellence that define the genuine Diasec product. While a silicon gel alone will temporarily bond, it will also readily peel away. Only with the catalyst is the bond to acrylic permanent. The Diasec gel provides UV filtering greater than 99%, when used with even the most basic of acrylics. Acrylics suitable for fine art can provide additional protection nearing a total of 99.99%! When cured, the resulting permanent bond will not de-laminate, bubble, peel, or otherwise separate — even at temperatures high enough to damage the acrylic. A typical shipping container or truck can reach summertime temperatures in excess of 130°f. At those temps, pressure sensitive optical adhesives (PSAs) begin to soften, and when combined with shaking and vibrations during transportation, can fail. The last thing you want is for your buyer to excitedly open their expensive print only to find that the adhesive has separated. As the first Diasec producer in North America, Reed is committed to ending this problem. The Diasec process protects you and your art and, in turn, protects your reputation with collectors and galleries. Pigment papers, with the occasional exception, are quite compatible with the Diasec process and look amazing! The wider gamut and significantly longer expected display lifespans of a proper Pigment Giclée print are a huge selling point for your collectors. Chromogenic papers often advertise a moderately good rating of around 70 years (estimated) under proper conditions. With the right combination of inks and papers, a pigment print may reach over 200 years (estimated) under proper conditions. We think it’s pretty clear which option your buyer will prefer. We were stunned by the beauty of fine art-textured papers within a Diasec mount. This dimension can be the visual turning point when it comes to convincing your clients to make the jump to this process. The print actually looks as if it’s “floating in acrylic” — an effect that must be seen to believe! Your image and the acrylic effectively become “one”. Your work is sealed from 99%+ of harmful UV light and the humidity that can accelerate aging. Air borne pollutants that yellow and stain, and cleaning vapors that can prematurely fade the print are a thing of the past. The sealed print is also protected from the threat of mold, mildew, bugs, and other nasties that never rest. And finally, a proper backer behind the print protects it from careless impacts to the verso once it’s in the hands of your collector or gallery. The preferred face-mount system of major art museums. Protection from over 99% of harmful UV. Sealed from humidity, pollution and other contaminants. Texture pigment papers are now possible for longevity and a unique look. Not prone to the typical failures of pressure sensitive optical films. Looks amazing, lasts a lifetime, and keeps your collectors happy. High end galleries and world class museums demand the very best in facemount-to-acrylic protection and presentation. Reed is proud to be the first licensed dealer in North America to offer Diasec’s state of the art technology in this very specialized field.